What is EBT and how does it work? Electronic Benefits Transfer, or EBT, is the way you receive and use your Supplemental Nutrition Assistance Program (SNAP) benefits in South Dakota. The benefits are deposited into your EBT account. By using your South Dakota EBT card and Personal Identification Number (PIN), you can spend your SNAP benefits. You can use your South Dakota EBT card anywhere in South Dakota and throughout the United States. A PIN, or Personal Identification Number, is the four-digit code you select when you receive your South Dakota EBT card. The PIN acts as your signature or authorization. Your card is not active and you cannot shop until you choose a PIN. You can choose a PIN by going online at www.ebtedge.com or by calling Customer Service at 1.800.604.5099. How long will my South Dakota EBT card last? Your South Dakota EBT card will last for years. You can use the same EBT card every month. If you do not keep the card safe and it becomes lost or stolen, you will need to request a replacement card by calling Customer Service at 1.800.604.5099. To make sure that SNAP rules are being followed correctly, we monitor replacement card numbers. We may require an investigation of your usage of the card and/or food purchases if you request multiple replacement cards. When do I receive my SNAP benefits? If you are a new applicant, you will receive a notice from your Department of Social Services (DSS) Benefits Specialist telling you when the SNAP benefits will be available in your EBT account. If you are an ongoing recipient, you will receive your benefits in your EBT account on the 10th of the month, even if the 10th falls on a weekend or a holiday. Where can I shop with EBT? You can use your EBT card at any retail food store, farmer’s market or direct-marketing farmer that participates in SNAP. Authorized retailers display the QUEST® decal on the door or in the shopping lane. A copy of the QUEST® symbol is on the back of your card. Any member of an eligible household who is 60 years of age or older may use their EBT card at authorized communal dining facilities and authorized nonprofit meal delivery services; i.e., Meals on Wheels, Senior Citizens Centers, Senior Apartment Sites or other Elderly Nutrition Sites. What can I buy with my Dakota EBT card? Contact the store manager if you have any questions on whether you can buy an item with your South Dakota EBT benefits. What does my South Dakota EBT card look like? Your card number is on the front of the card and there is a place for your signature on the back. How do I use my South Dakota EBT card? Customer Service at 1.800.604.5099. This balance will be the most you can spend. Step 2: Choose your groceries and go to an EBT check-out lane that displays the QUEST® decal. Step 3: Slide your South Dakota EBT card through the machine. Step 4: Make sure the purchase amount is correct. Step 5: Enter your 4-digit PIN on the key pad. The machine will show (****). DO NOT give the clerk your PIN. Step 6: Press the Enter key. Step 7: You will get a receipt showing your EBT card number, store location, date and time of purchase, purchase amount and remaining balance. Keep your receipt so you have your new balance. How do I remember my PIN? Choose four digits that are easy for you to remember, but hard for someone else to figure out. You SHOULD NOT use your date of birth or your Social Security number as your PIN. Write down your PIN at home and keep it in a safe place. Do not write your PIN on your South Dakota EBT card. Do not keep your PIN in your wallet, purse or with your EBT card. If you are in the grocery store and enter the wrong PIN, you have two more chances that day to enter the correct PIN. If the correct PIN is not entered on the third try, your card will be locked and cannot be used until the next day. If you cannot remember your PIN or think someone else knows it, you can choose a new PIN by going online at www.ebtedge.com or by calling Customer Service at 1.800.604.5099. You can let someone else use your South Dakota EBT card to buy food for you. Be careful, once you tell someone your PIN and give them your card they could use ALL your benefits. These benefits will NOT be replaced. How will I know the balance in my EBT account? Your last receipt shows your remaining account balance. Check your balance online at: www.ebtedge.com. Call Customer Service at 1.800.604.5099. What if the EBT machine is not working? If the terminal is not working, the cashier may fill out a paper voucher for the amount purchased with your SNAP benefits. Present your card to the cashier. Check the amount on the paper voucher to make sure it is for the correct amount of food you bought. If it is correct, sign your name and date the paper voucher. DO NOT give the cashier your PIN. The cashier will call Customer Service to make sure you have enough benefits to buy the food. If you do, the amount will be subtracted from your SNAP benefits account balance. Make sure you get a copy of the paper voucher from the cashier before you leave the store. Paper vouchers may also be used by authorized route vendors and food merchants (like direct farmers or farmer’s markets) that do not have an EBT machine. When the telephone lines are not available and the cashier cannot get an OK for your purchase, the purchase will be limited to $40.00. How do I take care of my South Dakota EBT card? You will use the same EBT card every month and your card will last for years. 1. Keep your South Dakota EBT card safe. 2. Keep your South Dakota EBT card clean. 3. Do not bend your South Dakota EBT card. 4. NEVER give the cashier your PIN. If your card is visibly damaged or you continually have problems at the store with the card not working, call Customer Service at 1.800.604.5099 to request a replacement card be mailed to you. Can I make a purchase without my South Dakota EBT card? No. You must present your South Dakota EBT card to the retailer and enter your PIN in order to buy food. What should I do if my South Dakota EBT card is lost, stolen or damaged? If your South Dakota EBT card is lost, stolen or damaged, immediately call Customer Service at 1.800.604.5099 to report it. You will need to request that a new card be mailed to you. No one else can use your South Dakota EBT card once you report it lost, stolen or damaged. It is important that you make sure DSS has your most current mailing address at all times. If your address is not current, you will not receive your EBT card. How long will it take to get a replacement EBT card? If you need a replacement EBT card you will need to call Customer Service at 1.800.604.5099. A replacement card will be mailed to you on the next business day and should be received by you within 5-7 business days. What will my receipt look like? Your receipt will look similar to the receipt below. It will state the merchant's name, location, transaction type, transaction amount and the household's remaining SNAP balance. What should I do if I get an error message using my EBT card at the store? If your card does not work or you get an error message you do not understand, visit www.ebtedge.com or call Customer Service at 1.800.604.5099 for assistance. Card not on file. Contact Customer Service at 1.800.604.5099. Invalid PIN. You have entered the PIN incorrectly. If you enter the wrong PIN three times on the same day, a lock is put on your card until the next day. Insufficient balance. You have tried to spend more benefits than you have in your account. Put back some of your groceries or pay the remaining amount due with your own money. Inactive card. You did not select a PIN. Call Customer Service at 1.800.604.5099 to select a PIN. What if I get a “Card Cannot Be Used” error message? You will get this message if your card has previously been reported as lost, stolen or damaged. 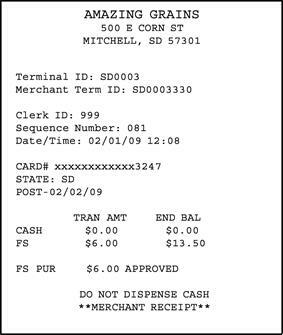 You will also see this message when the magnetic stripe is damaged and the EBT machine cannot read the data needed to get authorization for the transaction. Contact Customer Service at 1.800.604.5099 to request a replacement card. How often do I need to use my card? Will my benefits carry over from month to month? You should use your South Dakota EBT card at least once every 30 days to keep your account active. SNAP benefits carry over from month to month and can be used even when your SNAP case closes. When you have not used your account for 365 days, remaining benefits will be removed and cannot be replaced. How do I take something back to the store? Can I get cash back for the returned item? Take the item and the receipt back to the store. The store will put the amount back into your EBT account or you can select a new item from the store. You will NOT receive cash. If you plan to move, contact your Benefits Specialist to report your new address. It is important that you make sure DSS has your most current mailing address at all times. If you address if not current, you will not receive your EBT card. If a card is mailed to your old address, it will not be forwarded to your new address. If you move out of state, you can use your South Dakota EBT card at any authorized retailer in the United States to spend your remaining South Dakota SNAP benefits. Authorized retailers will display the QUEST® decal on the door. The decal will look exactly like the QUEST® symbol on your card. If you wish to receive SNAP benefits in your new state you need to apply for benefits in that state. Should I destroy my South Dakota EBT card if my SNAP case closes? No. You should spend the available benefits in your EBT account and then keep your South Dakota EBT card. 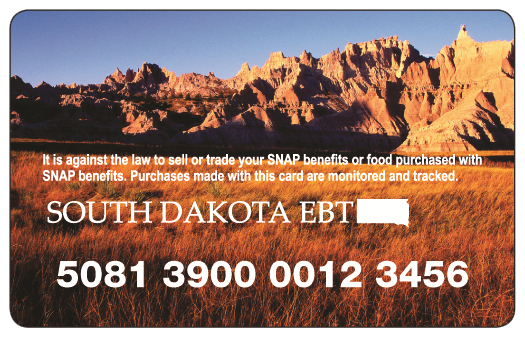 It may be possible to use your same South Dakota EBT card if you decide to reapply for SNAP benefits in South Dakota. You can visit www.ebtedge.com for assistance or you can call the toll free number, 1.800.604.5099 from any telephone in South Dakota at no charge. You should call Customer Service immediately to report a lost, stolen or damaged card, request a replacement card, obtain your balance, or if you have questions or need help with EBT. When calling to see if benefits have been deposited to your account, multiple calls on the same day are not needed. If the benefits are not in your account when you call, they WILL NOT be available that day. Please check with your Benefits Specialist to see when to expect your benefits. What if I have questions about EBT? You can go online to www.ebtedge.com and look at the Cardholder Help Topics, contact Customer Service at 1.800.604.5099 or contact your Benefits Specialist at your county DSS office. How do I contact Customer Service online? The client website is: www.ebtedge.com. You can log on using your card number and PIN and use the website to get your balance, view and download your account history, select or change your PIN, send messages to Customer Service and receive replies.